Table top trade show displays are budget friendly, portable, and simple to execute. They provide a fast trade show solution without cutting into your time, or budget, and create an effective portable display solution. Our wide selection of table top trade show booths include optional LED lights and hard cases for easy transport, and can setup in just minutes for any trade show event. Choose from pop up display or snap tube frames, all backed by our lifetime warranty! Table Top Trade Show Booths and Portable Displays! Not in the market for a full back drop or pop up display? Not too worry, these table top solutions are perfect for taking your company to the next level. With stunning, high quality graphics a table top display will help capture the leads and attention you are looking for at your next trade show. 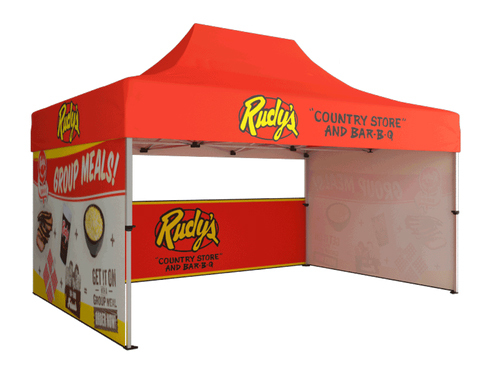 Save space and money when exhibiting with a Pop up display or portable table top trade show booth! What's great about table top trade show displays? If you are eager to utilize that table inside your booth in the best way, look no further. These lightweight and sturdy displays are going to turn heads and allow that crucial information to be front and center. Table top displays are budget friendly, compact and durable which makes them a perfect asset to your booth. Added benefits to a table top pop up display? No one wants to spend half a day setting up their trade show booth nor do you want to dread having to do it. Take the added stress and hassle off your plate with speedy set up and take down which allows you that extra time to prepare to kill it on the trade show floor. With maximum portability, these table top displays can be easily popped up anywhere you need. Whether you are travelling on planes, trains or automobiles you could truly benefit from a compact, lightweight yet efficient display. We can argue this point three ways to Tuesday, but at the end of the day, it's not the size of your trade show booth, but how it's presented and branded in terms of it's appeal and marketing strategy during your event! A table top trade show booth can get the job done as well as any other marketing backdrop, so let your brand jump out by making sure you have the right layout, and booth chemistry. There is nothing more important than a smile at a trade show. Wear a smile and you can say hello to names, email addresses and sales. Although it is questionably the most important asset at your show, having an eye catching set up is the next best thing. Creating bold marketing strategies will allow your booth to pop and speak for itself. When you gather the right resources, you provide an unforgettable experience for your consumers which closes deals for you and not your competitors.